Ride Rehabs - These dates are not guaranteed to be 100% accurate. General Park News - (4/4/19) Consider me impressed. While I don’t have Planet Coaster, the fact that this user made a full recreation of the Indiana Jones Adventure attraction, with the complete queue and ride experience, just blows me away. Most Impressive! Check it out below. (2/3/19) Good news today for Disneyland fans as Space Mountain was cleared and reopened on Friday after the investigations over the man who forced his way out of a train in mid-ride were completed. No word on what exactly was determined in the reports, we just hope the OSHA or the insurance companies don’t use this as an excuse to put horse-collar style restraints onto Space Mountain as Splash Mountain was forced in adding lap-bars for a similar reason. (2/1/19) In a classic “What the Hell? !” moment… a 20 year old man climbed aboard Space Mountain at Disneyland on Tuesday and then once the ride was in motion, managed to “use force” and contort himself free of the locked restraints and then climbed out of the train while it was making the slow journey from the station to the top of the coaster. I’m unsure if he climbed out in that one dark corridor between the lifts, or if he simply exited during the lift hill itself, but he managed to do it all and was injured in the process. (1/25/19) Micechat has posted a very interesting article for Disneyland fans, going over a park improvement initiative taking place at Disneyland known internally as “Project Stardust”. The program seeks to both enhance park features as well as address the growing needs of Disneyland with enhanced new queue spaces (Dumbo, Space Mountain and Matterhorn as examples from 2018), wider pathways where possible and do what they can to increase overall capacity in all areas to handle the park’s year-round heavy crowds. Plus they are looking into ways to streamline the construction process so that these projects can happen more quickly than they have in the past. (11/20/18) The Matterhorn has reopened at Disneyland… along with a very different queue that puts the majority of the queue switchbacks in what was once the park pathway just outside the ride’s old traditional queue area, which removes the need to wrap the lines around the side of the mountain any longer. Late 2018 - The Tropical Hideaway - (12/23/18) Take an after-dark peek all around the new Tropical Hideaway area at Disneyland with some new photos posted to DisneyGeek. The new area is located just to the left of the Jungle Cruise, sitting at the exit of the Tiki Birds. (12/13/18) The Disney Parks Blog has posted some of the first pictures of the new Topical Hideaway area opening soon at Disneyland. Lots of fun details in the pictures, including a look at Rosita who will make small talk with guests while she waits for her boat to arrive. Follow the link and check it out! (11/4/18) According to the Disney Park’s Blog, Rosita, the former cockatoo from the Enchanted Tiki Room attraction will reappear as part of the new “The Tropical Hideaway” area opening later this year. Look for Rosita along the rivers edge where the Jungle Cruise vessels return back to port. (8/29/18) The Disney Parks Blog reports that The Tropical Hideaway in Disneyland will be ready to open later this year. They also go into detail about what kind of interesting menu items will be available here, as the location will serve as an exotic marketplace for interesting food items from around the world. This include three flavors of warm steamed bao buns, pinapple lumpia, ramen salad and more. (2/24/18) Disneyland has announced that the former Aladdin's Oasis near the entrance to Adventureland will be transformed into "The Tropical Hideaway". They describe the new experience as a "one-of-a-kind destination" and "popular rest stop for Adventureland locals and weary explorers alike" where you can rub elbows with your "favorite skippers in an exotic trader's market, featuring all the sights, sounds and flavors of the tropics." So what exactly is it? Based on the art it kind of looks like a bar/lounge area, but since Disneyland doesn't serve alcohol in the park, I can only assume they will be serving up a collection of family friendly tropical beverage creations along with other quick grab snack items. I love the look however, and it sure will fit into the themeing of the area better than Aladdin's Oasis ever did, nestled nicely in-between the Enhanced Tiki Room and Jungle Cruise. Oh... and with a Jungle Cruise movie featuring Dwayne Johnson set to go before cameras this year, I can only assume this area could be used to help promote the new film in 2019 as well. Dwayne Johnson character meet 'n greet? Maybe not, but would be a hell of a surprise for guests as a one-day PR stunt if he were to captain and tour or two on the Jungle Cruise. (Disney did have Mark Hamill surprise some guests on Star Tours last year after all...) At the very least, while the themeing is still sort of generic in the artwork, I think this may only be a Phase 1 makeover, with more to come in 2019 to tie it into the Jungle Cruise film. 2019 - Mickey’s Mix Magic / Mickey’s Soundsational - (11/21/18) Disneyland has announced that starting in January 2019 Mickey’s Soundsational Parade will return, complete with a brand new Mickey Mouse float that will lead the parade down Main Street. Also starting on January 18 is Mickey’s Mix Magic, a musical dance party celebration set to transform much of the park after dark. If you need a reminder of what Mickey’s Soundsational looks like, check out Screamscape’s own video below showing off the parade when it premiered back in 2011 while attendance the media preview days. Summer 2019 - Star Wars: Galaxy's Edge - (4/19/19) One lucky Cast Member gets some awesome bragging rights, claiming that in addition to Han, Chewie, Lando and Rey… he has also flown the Millennium Falcon as part of testing out the new attraction for Disney Imagineering. Talk about awesome nerd-culture cred… and I have to admit I’m jealous as hell too, because who wouldn’t want to say they got to fly the Millennium Falcon? Of course, starting this summer, that exclusive group of people is going to grow signifigantly once Star Wars: Galaxy’s Edge opens at Disneyland and a short time later at Walt Disney World. Follow the link and read on to hear more about what does seats control what in the Falcon’s cockpit. Oh, and one more bit of fun Star Wars: Galaxy’s Edge news… Paul Reubens himself confirmed that he will provide the voice for the former Captain Rex droid that has been repurposed as DJ-R3X, a joking DJ droid inside Oga’s Cantina. (4/14/19) Previously I had thought that I had heard Disney would be going the route Universal took with their Wizarding World lands, by not allowing real-world soda and beverages to be sold in Star Wars: Galaxy’s Edge. Now a new report from CNN kind of backtracks on that a little, explaining there is a new deal in place with Coca-Cola to be present in the land, but you’ll buy a Coke, Diet Coke, Sprite or Dasani bottled into strange new containers that may keep some of the same color styling of the Earth beverages, but will look like a Star Wars universe take on them, and with the names written in Aurebesh, the lettering system used in the Star Wars universe that you will find used extensively throughout the various structures within Galaxy’s Edge. It’s an interesting “cheat” on the concept of keeping the land pure to the world of Star Wars, plus what a collectible! These unique bottles will only be sold within Galaxy’s Edge, but you can lug a few home to show off to your friends since they look a bit like a cross between a grenade and a mini BB-8 style droid. (4/9/19) Ready to get your intergalactic food and drink fix? Our friends at BlooLoop dish more on what we can expect from the exotic and alien food and beverage landscape to be experienced within Star Wars: Galaxy’s Edge. Meanwhile the local news in LA sent a chopper to fly over the new land and get us the latest look at the Black Spire Outpost, Millennium Falcon and all the rest as the final touches are being installed in a lengthy 10 minute long overview. (4/4/19) BlooLoop is back with another look at Star Wars: Galaxy’s Edge… this time taking a look into how the complicated back-story for the entire land was created so it could fit into the film world and official story-lines. (3/27/19) While the world may have to wait a bit longer for the Rise of the Resistance dark ride to open inside Galaxy’s Edge, the latest report on BlooLoop goes into a bit more detail about just what we can expect to find inside the world’s most anticipated new dark ride experience. (3/22/19) A detailed look about what we can expect to find within the Millennium Falcon: Smuggler’s Run attraction at Disneyland has been posted by our friends at BlooLoop this week. Check it out! (3/8/19) Despite my hopes that Disney might have just tried to avoid the huge headache that a grand opening for Star Wars: Galaxy’s Edge would bring, they opted a few hours ago to announce official opening dates for each coast. Disneyland will open their Galaxy’s Edge on May 31st and Walt Disney World will open their version on August 29th. So now the crowds know when to descend upon Disney, but oh wait… and situation is going to get a little worse than we expected. If you watch the promotional video Disney posted on Twitter, be sure to read the fine print near the end when they post the dates. “Capacity is limited. Star Wars: Rise of the Resistance attraction opens later this year.” And yes, this applies to both parks… so when Galaxy’s Edge opens, and all those people arrive… your wait time just doubled, because there will only be one attraction (Millennium Falcon: Smuggler’s Run) ready to open. For those of you who have dealt with the crowds at Disney’s Animal Kingdom in Pandora, imagine what the lines would be like if it only opened with one functioning attraction instead of two, and you may see my point. Disneyland guests also take note… because you have more fine print to read. It also says, “Reservations required for visits between May 31 and June 23”. So for the first four weeks guests to Disneyland will not be able to even enter the Galaxy’s Edge land unless they have signed up for a free reservation online ahead of their visit… though these will be limited and subject to availability, but otherwise the information about these reservations will be coming at a later date. Guests staying at one of the Disneyland Resort hotels during this time period who have already signed up for theme park admission as well will be assigned a reservation date, though again… final details about this are still to be announced. If there is one bit of sane news, it is this… Disney has confirmed that when it initially opens there will be no Fastpass (or MaxPass) reservations available. Access to Millennium Falcon: Smuggler’s Run will funnel everyone through just one big line, like the good old days. Oh… and the height restriction for this attraction will be 38 inches. When Rise of the Resistance opens later in the year, you will have to be 40 inches tall to experience that one. (3/3/19) Want to ensure you will be able to experience both of the new Star Wars attractions on your visit when they open? You might want to be prepared to open your wallet a little wider. The rumors started almost as soon as the project was first announced years ago, but so far we’ve been hearing that Disney management is heavily considering only allowing the use of a special extra cost level FastPass option when the lands first open to try and control the chaos. At Disneyland, this likely means that they could require guests to only use the existing extra-cost “MaxPass” system, and while Walt Disney World currently has no such system in place, they’ve got the time to see how it all works out when Disneyland opens first before making a final decision about how things will work at Walt Disney World, especially in regards to hotel guests who get to make FastPass+ reservations 60 days out from their visit. Stay tuned… as we get closer to the opening of the Disneyland version (likely in June) I’m sure more concrete information will start to flow. (3/1/19) A great collection of new photos and concept art showing off in inside of Galaxy’s Edge in more detail than ever can be found over at StarWars.com this week. This includes an actual look inside the First Order Star Destroyer as well as the halls of the Millennium Falcon. We also get a look at some of the otherworldly food items you will be able to try, some new exclusive merchandise you can buy (need a Droid? Want to build your own lightsaber?). There is even a list of 27 new facts about Galaxy’s Edge, including characters you might run into, where this all fits in the Star Wars timeline, clothes you can buy in Galaxy’s Edge to fit right into the Galaxy Far Far Away and much more! Oh… one more thing, you will want to have the Play Disney Parks App downloaded and running on your smartphone when you enter Galaxy’s Edge because it will automatically switch over to a Star Wars datapad app once you enter the land, unlocking some missions you may want to complete, telling stories and details about the land, and giving you a way to interact with your surroundings like never before. They also say you will be able to translate the language used on the signs with the app, hack droids and receive messages from various characters. (2/16/19) How many days until Star Wars: Galalxy’s Edge opens? How long? When? Tell us when already! This is the question on everyone’s mind, including the competition as it seems no one want sto announced anything or to try and hold their own grand-opening event anywhere near the date when Disney is going to open Star Wars. Case in point… this is likely still the major reason why Universal has yet to release any details or even the name of the new Wizarding World coaster opening in Islands of Adventure this year. (1/17/19) BlooLoop has posted a new preview about what we can truly expect to find within Star Wars: Galaxy’s Edge when it opens later this year. (12/27/18) A new teaser video from Disney showing off Star Wars: Galaxy’s Edge has been posted which actually seems to feature some footage shot in the land (made to look as if it was open), as well as some new footage that looks to be shot on both of the main attractions themselves that looks incredible. (12/6/18) Is there is one thing that I can predict with certainty… it is that the crowds that will descend upon the Disneyland Resort for the grand opening of Star Wars: Galaxy’s Edge will be INSANE! We’re talking long lines that will last hours… and not just for the rides! Guests will wait to get into the land, wait to get into the park itself… and heck… you might be waiting a long long time just to park your car before you come face-to-face with the rest of the chaos awaiting you. Just how long are we talking about here? According to the latest feature on BlooLoop, some experts are claiming that as many as 200,000 people could attempt to invade Disneyland on that fateful day, causing wait time of at least 10 hours! Now before your head explodes know this… there is no way that 200,000 people are going to get inside Disneyland. Nope… no way… not gonna happen. They’ve closed the gates to stop letting people with far smaller numbers for busy days like New Year’s Eve and 4th of July. That said… it’s just going to be miserable in there anyway, but one might think that Disney may offer passholders and other special guests a chance to pony up big cash for exclusive preview night events in advance to view it away from the madness of opening day. Plus we don’t even know how Disney is going to handle FastPass on these attractions, if at all, during the opening weeks… or if that rumor about it being an exclusive upcharge MaxPass option may hold true. Stay tuned as we wait on Disney to work out the kinks on how they are going to handle the crowds on this beast of a grand opening. (11/29/18) It’s almost as if someone screen captured an image from the dream of every Star Wars fan, but the latest aerial photos from Galalxy’s Edge in California now show that the scale mockup of the Millennium Falcon has now been placed within the park. In a word… she is beautiful to behold, even from this distance. I can’t wait to see it in real life… where I will probably shed a few emotional tears when no one is watching. (11/24/18) Curious to know some of the costs involved with Star Wars: Galaxy’s Edge? According to a new report over at BlooLoop, the Star Wars themed land going into Disneyland in California is estimated to be costing Disney around $1 billion just by itself. Some of the generalized cost breakdowns for certain attractions were spotted in a leaked document including $55.7 million for the Millennium Falcon: Smugglers Run attraction and $77.9 million for the Rise of the Resistance attraction. Perhaps one of the most interesting things spotted in the document however was the mention of an “Attraction #3" planned for Galaxy's Edge. Certainly the addition of a third Star Wars attraction would be welcomed… but it does make me wonder what it could be. At one point, years ago, I had heard the suggestion that perhaps Disney might think of relocating Star Tours from Tomorrowland over to Galaxy’s Edge, though that rumor was quickly shot down. So anyone else know what this could be for, or is it simply a placeholder for future growth needs? (11/20/18) Disney announced some great new details about Star Wars: Galaxy’s Edge over the weekend. For starters, we have the official names for the land’s two attractions, along with some new teaser videos for each: “Millennium Falcon: Smugglers Run” and “Star Wars: Rise of the Resistance”. Below that, check out the third video where John Williams is creating all new Star Wars themes and music exclusively for Galaxy’s Edge, and you can hear a sample piece of some new music. (10/18/18) The Disney Blog has posted some great new aerial photos of Star Wars: Galaxy’s Edge at Disneyland as they push forward with construction to finish it up in the next 6-8 months. They’ve also got some comparison photos showing off how things have changed over the past 12 months. (5/28/18) The Star Wars: Galactic Nights event was held at Disney's Hollywood Studios park and some new details, photos and pieces of concept art were released regarding the Star Wars: Galaxy's Edge attraction area under construction. For starters we have the name of the actual port-city you will be walking around inside... it will be called "Black Spire Outpost" and is described as the largest settlement on the planet Batuu. The spaceport is a popular one with "traders, adventures, and smugglers traveling around the Outer Rim and Wild Space" due to its location being really off the beaten path. In other words... they've been operating in the Empire's blind spot with great success for some time now. You can scroll through the many pictures posted to Disney & More collected from the event, which includes three actual pictures of the massive pair of AT-ATs constructed inside the attraction itself where you battle The First Order. An image of a new starship was also shown, a "Resistance Troop Transport" which guests will board to go on their journey. For you Star Wars fans out there, I think you'll like this one as the new starship looks a lot like a mini-bus version the classic Corellian Corvette (CR90) blockade runner class ship. Another fine product from the minds of the Corellian Engineering Corporation most likely. Other new factoids to drop was the fact that the character Nien Numb will play some kind of roll in an attraction at Galaxy's Edge. Nien Numb is best known to most fans for serving as Lando's co-pilot on the Millennium Falcon during the attack on the second Death Star in orbit over Endor in Return of the Jedi (Star Wars Episode VI). Disney is also working on a way to bring versions of various animal-like creatures to life for Galaxy's Edge, including the Tooka Loth-Cat from the Clone Wars and Rebels animated series. To learn more, check out the great video posted by BigFatPanda who was sitting in the front row last night at the Galaxy's Edge Panel discussion show, featuring Warwick Davis, Scott Trowbridge and more. It's a little over 30 minutes long, so grab a snack first, then sit back and enjoy. (5/24/18) Disney has officially confirmed that Star Wars: Galaxy's Edge will open to guests for "Summer 2019". As I had been saying for some time now however, Walt Disney World wont be so lucky and the official date for the Floirda version is listed as "Late Fall 2019"... which essentially sounds a lot like the week of Thanksgiving at this point. Either way, they'll be opening these new additions just in time for the most crowded peak-seasons for each resort, so expect lines, crowds and more lines. (4/14/18) Who's ready for a peek as some possible attraction footage from the upcoming Millennium Falcon ride experience? Apparently a demo of the visuals we will get to experience was shown off for an audience somewhere, with claims that this isn't just canned CGI video footage, but that the entire environment was being rendered in real-time in 4K quality. Why rendered in real-time? Because it looks like Disney will hold true to the promise that we will actually get to pilot the Falcon, allowing guests to take her on a custom ride through the Star Wars universe. Fantastic! (3/9/18) Want to see something really cool? Disneyland released some awesome footage of a drone-cam flying over and through the Star Wars: Galaxy's Edge construction site that will make you wish it was already 2019. Check it out below. (3/6/18) Fitting in with an earlier rumor we were told, the new attractions coming to Star Wars: Galaxy's Edge are both supposed to be utter knock-out attractions in their own way. The story at the time was that Disney Imagineers were pulling out all the stops to really plus these experiences up to be like nothing else we've seen before. Even if it means that might have lower capacity than you might think, which could be a problem given how big the lines are expected to be. Much like how Universal Orlando opened Diagon Alley a few years ago, it is already expected that you may have to have some kind of pass just to get INTO to Star Wars: Galaxy's Edge land at all. But those attraction lines? The lastest rumors claim almost everyone is going to end up waiting in them, as the two attraction may not open with FastPass at all, but instead may only accept the pay-to-play MaxPass system instead. (1/15/18) Lots of construction is taking place around the Disneyland Resort this week. DisneyGeek has sent in some links to some photo galleries of the bigger projects like Star Wars: Galalxy's Edge and the refurbishment of the Main Street USE Streetcar Tracks. (12/26/17) Some awesome new aerial photos of the Star Wars: Galaxy's Edge construction site at Disneyland have been posted to WDWNT this week. (12/15/17) While there is still so much about Star Wars: Galaxy's Edge that we don't know about, Disney did leak one impressive photo on Twitter yesterday showing off what appears to be the hallway that leads to the cockpit of the Millennium Falcon. While this could just be a photo taken on the set of the film, I've got a feeling we may be looking at the entry-way into the cockpit (rider vehicle) of the yet-to-be-named Millennium Falcon attraction. (12/4/17) A reader sent in a quick photo of what the Star Wars: Galalxy's Edge construction looks like now from the outside the park, and as you can see the view has pretty much cut off by by the walls of the massive attraction buildings along the park's edge, though you can still see the rocky-spires rising up on the left side that I believe will be viewable outside the entrance to the Millennium Falcon ride. The scale of it all is so massive and impressive already... 2019 can't get here soon enough. (11/11/17) An assortment of new construction pictures from the California version of Star Wars: Galaxy's Edge have been posted to ThemeparX over the last few weeks as the various buildings along the property's edge are now in the process of being sealed up from the outside world. This means no more peeking at the ride system hidden inside until it opens in 2019. (8/24/17) Star Wars: Galalxy's Edge has installed their "topping off" piece of steel onto the construction site, putting in what will be the tallest point of the entire new theme park land. You can see pictures of the piece installed, complete with a tree and flag as per construction tradition in an update posted to Disney and More. Before being placed Disneyland Resort Cast Members were invited to sign the large piece of steel as well before it was lifted into place. (7/24/17) Some of the latest construction photos from the new Star Wars: Galaxy's Edge construction site at Disneyland can be found posted to DisneyGeek this week. (7/20/17) As rumored, Disney confirmed that the new Star Wars themed lands will indeed be called Star Wars: Galaxy's Edge when they open in 2019 at Disneyland at Disney's Hollywood Studios parks. An impressive model of the huge land was on display at the D23 Expo which we mentioned last Saturday, so if you haven't seen it yet, scroll down to the video and take a look at all the beautiful detail. New artwork showing off a hint of what scenes from the "First Order Battle Attraction" as well as a ride inside the cockpit of the Millennium Falcon (now outfitted to have 6 seats) will look like. The First Order ride shows off a scene inside a huge hanger inside of a Star Destroyer, "an attraction built on the scale we've never done before." This would be the same attraction that we've seen the steel framework for a pair of AT-AT walkers set up inside as well, so you can imagine how big the scenes inside this attraction be. "The second attraction will give guests the opportunity to fly the Millenium Falcon, piloting the ship, shooting blasters or preparing for hyperspace – all while completing a critical mission. But how you perform on the mission holds even bigger stakes: perform with skill and you may earn extra galactic credits, while bringing the ship back banged up could put you on the list of a bounty hunter. End up on Harkos’s list and you may face a problem if you show up at the local cantina!" Speaking of the cantina... Disney has even confirmed that Rex, the former pilot of Star Tours, is alive and well within Galaxy's Edge where he has taken on a new job as a DJ at the local cantina. While you enjoy the latest tracks, you will also be able to enjoy a cool glass of "blue milk", a custom drink created just for Galaxy's Edge. (7/15/17) D23 is underway and while the official Disney Parks presentation isn't until later today, lots of little things have been already revealed and/or leaked out. For starters, apparently the source code of the Disney Parks Blog accidentally contained a reference to the true name for the "Star Wars Land" spotted by the always curious people at Reddit who seem to excel at this kind of thing. The code has since been removed, but according to the source code it will be called, "Star Wars: Galaxy's Edge" which does make sense considering how they have described the theme of this location from the start. Also, who's ready to see Star Wars: Galaxy's Edge? Our friends at Behind the Thrills have posted a video looking over the Star Wars booth at D23 where a huge scale model of Galaxy's Edge has been set up showing off every nook and cranny is perfect detail along with awesome concept art, costumes, and much more. Watch through to the second half and they even have a model of the ride vehicle you will sit in for the "First Order" ride, an 8-passenger (2 rows of 4) trackless vehicle piloted by a black and red Imperial Astromech Droid in the front. The inclusion of the droid pilot also does help explain how an interesting twist of the ride's rumored experience will take place, as you may recall the rumors that at one point guests will be asked to depart the vehicle and take a journey on foot in the middle of the ride, only to find and climb back aboard the vehicle elsewhere in order to make your escape. Nothing like a timely rescue by your friendly/sassy Imperial Astromech Droid, who has been reprogrammed to assist the Rebel Alliance. Take a look at the video below and look about at the world of Galaxy's Edge in art and the model... and you’ll notice something right away. This looks more like a model built to film a movie special effects scene from the old days (before digital effects) and not so much like something for a theme park. Why is this? Because it looks like a living, breathing world... no sign of tacky theme park style gift shops, vending carts, queues, or even stroller parking spots. Could Disney have decided to take a nod from Universal’s Wizarding World of Harry Potter concepts and be rolling out their own persistent world rules for Galaxy's Edge? For example, at Universal when you are inside one of the Wizarding World areas, you can’t even buy a Coke to drink or a bottle of Dasani branded bottled water to drink. All the food and beverages are themed to the Wizarding World universe. In the case of Disney just launching Pandora: The World of Avatar at Animal Kingdom a few weeks ago they had fully embraced the concept of themed food and beverages, but you can still also get Coke brand products because... hey... why not? It’s themed around the Earth of the future and you know Coke is still going to be around. But in the case of the Star Wars Universe... Earth is not a part of it and everything you know about food and even merchandise is... well.. from a Galaxy Far Far Away. So it would be very impressive if Disney were planning on going this route where they have to redesign everything to function and look in a new way and somehow keep the elements of the outside world just beyond the Galaxy’s Edge from creeping in however they can. (6/26/17) The latest construction photos from Disneyland can be found at DisneyGeek this week. They've got pictures of Star Wars Land, new pics of the reopened Tom Sawyer's Island and a look new railroad area passing behind Rivers of America where the trains have begun making test runs on the rails during the daytime. (5/14/17) The latest look at the Star Wars and Rivers of America construction sites at Disneyland were posted to DisneyGeek this week as those giant steel frameworks for the Star Wars buildings continue to grow even larger each and every week. (4/24/17) This week we take a look inside the Star Wars Land construction zone with a new update from our friends at DisneyGeek. (4/18/17) Some interesting news about the new Star Wars Land came out over the weekend when it was mentioned at a Star Wars Celebration Orlando panel that the actions you take within the land’s attraction (or those you decline to take) will help build up some kind of reputation profile on you and cause certain effects on your experience elsewhere within the land. For example, it your skills in the cockpit on the Millennium Falcon attraction are exceptional, you could attract the attention of certain characters who may seek your services elsewhere. By contrast, if you bungle your duty and bring the Falcon back with some extensive damage due to your bad pilot skills, you may also have to answer for that in some fashion elsewhere. The First Order will also have a presence within the land, so I suppose if you really stand out in your fight against them in the First Order battle attraction, you could find yourself on their most wanted list while they patrol the city. Or perhaps you'll even find yourself being trailed by a Bounty Hunter. While this all sounds amazingly cool to me, I suppose there could also end up being some kind of outcry against this kind of guest profiling from those who value their privacy above all else, and would probably rather keep their experience as anonymous as possible. Depending on how this all plays out, it should be interesting to see how Disney can cater to both ends of the spectrum, allowing some guests to go unnoticed while others are seeking a Westworld style interactive experience. Oh, one more thing… while I assume most of you have already seen the launch of the new teaser trailer for the new movie coming this December, you may have noticed one interesting scene where a group of flying ships appear to be crossing a large empty piece of terrain, but dragging something below them into the dirt, causing a red dust-cloud to appear below them. Apparently this is the planet “Crait”, which will be used as the location for a new action scene to be added to Star Tours after the movie hits theaters. (4/11/17) A great new video showing off the progress of Star Wars Land at Disneyland was posted to YouTube this week, but this isn't your average video... this one was shot from the air by a local news chopper who was allowed over Disney airspace to cover an small incident that took place on the Guardians of the Galaxy tower, but while they were in the airspace, they decided to grab some awesome footage of Star Wars Land construction. While I don't have the full footage of the land itself to share (it may have been taken down... I'm not sure) screen captures and a basic rundown of what we are looking at were posted to another video which is worth checking out just to get the unique view and lay of the land, so check it out below, but you'll probably want to jump about 2:30 ahead from the start to get to the start of the good stuff. You can note the large building that is the Battle Escape ride, as well as a couple of interesting foundation circles in the ground that should be for whatever the Millennium Falcon themed ride is going to be. It has been pointed out by a couple of readers who think these look similar to how Mission: SPACE at Epcot looked during construction (except Mission: SPACE had 4 of them). I wouldn't go too far along that line of thought necessarily, given the motion sickness issues along with lawsuits between Disney and the that particular simulator manufacture that went on over various issues with that ride system. That said, the long running story is that it is supposed to be some kind of cockpit simulator for the Millennium Falcon, so perhaps some of the basic concepts could carry-over to make a next-gen kind of creation. Meanwhile we also get some new views of the Battle Escape ride building, along with another odd round structure next to it (or part of it) with thick walls going up around it, and a central structure covered in scaffolding. Bonus... you also get a good look at the new train and river course that they are rushing to finish in time for summer. You can also pop over to ThemeparX for some new images shot from the parking structure as well. (3/17/17) It seems Disney has now confirmed the presence of the AT-AT's inside the new Battle/Escape attraction and have even posted their own video teaser of them under construction which you can see below. Meanwhile a newer picture posted to Twitter this week here shows the AT-AT's now assembled and have been placed INSIDE the attraction building, so it seems these massive walking tanks will be part of the attraction experience itself. (3/14/17) MouseInfo posted an interesting photo on Twitter from the Disneyland construction site for the new Star Wars land this week, spotting a pair of steel framework structures that sure look like a dead-on match for the main body of an Imperial AT-AT, along with two smaller units nearby that would work perfectly as AT-AT cockpits. If I had to guess, these would most definitely be props for the outside (and queue?) of the Battle/Escape dark ride experience planned. After all, Walt Disney World's version has already had a nice AT-AT standing guard in front of their Star Tours attraction for years. (2/16/17) According to what I've been told that new building structure going up in Star Wars Land is for the "First Order" dark ride attraction. Elsewhere in the land the foundation work for the Millennium Falcon ride apparently also began last week. I'm wondering if that is what that large circular concrete foundation being poured last week was for. More great pictures of the steel for the new attraction building going up have been posted to Westcoaster this week, so check them out. (2/13/17) Who's ready for a look at some tall steel finanally rising into place on the future site of the Star Wars Land at Disneyland? DisneyGeek has you covered with video and photos of the site, looking over all the poured concrete sections as well as the steel rising for one of the large new building structures. Plus you get a peek at some of the rockwork being finished up along the new backside of the Rivers of America that will hold the new route for the Disneyland Railroad, all while hiding Star Wars Land from few from that side of the park. Now when is Disney going to finally drop the final name for this thing anyway? It's starting to sound a bit silly to keep calling it Star Wars Land, even though that is exactly what it is, so can we get a final name reveal already? (1/1/17) A huge collection of new construction photos from Disneyland, including a look at the current progress on Star Wars Land as well as the new Northern end of the Rivers of America can be found over at DisneyGeek this week. They've also sent us a few good shots just to whet your appetite. (12/19/16) While things are still too far away to guarantee this for sure, Screamscape sources tell us that the first Star Wars land to open will be the Disneyland version, currently tracking to open in the first half of 2019, with the Walt Disney World version tracking to open about 6 months later in later half of 2019. Just don't buy your plane tickets yet, because a lot can happen between now and then, pushing the timetables months in either direction, but at least things are looking better than the previously rumored 2020 date for the moment. (11/21/16) Fun news for Star Tours fans. Bob Chapek announced at a presentation that they are working on adding one or more new scenes to the attraction that will be themed to the new "Episode 8" film hitting theaters in December 2017. I'm going to guess that the new material could be added to the ride sometime in the first half of 2018. On a semi-related note, Disney also released a new piece of artwork showing off how the new Star Wars themed land may look at night. (10/19/16) In an interesting bit of news mentioned to me, those leaks last week about the Star Wars Stormtrooper battle/escape themed dark ride were apparently fairly on target, including the bit about getting out of the vehicle in mid-ride to walk around a themed environment before jumping back on and taking off once again on your dark ride experience. The trick here is that when you get out to explore the environment, you will apparently be going on a specific path, where I imagine you will be kept separate from other guests somehow either by timing your experience to run through specific rooms in a specific order, or perhaps you will enter into one specific room of a group of identical rooms. Either way, from what I'm told, the actual vehicle you return to will not be the exact same one. Between this and a ride experience that takes place inside a very large multi-level building structure, and an experience being designed from the bottom up to be the most intense themed adventure story attraction that Disney can tell, we are looking at something coming down the pipe that will be like nothing any of us have experienced before. I can't wait for it to open... whenever that will be... because apparently no one knows when it will open because there is no set date... only that Disney wants to finish it all as soon as possible. The goal is to be able to open both the California and Florida versions at the same time, but it also seems fairly clear that Florida is fairly behind schedule by comparison to where Disneyland is at right now. So we'll just have to wait and see... a lot can change over the next couple of years. (10/14/16) DisneyGeek has sent over a few images showing off the construction taking place along the River and backstage area for the new railroad and Star Wars land. You can see even more if you follow the link. (10/10/16) I'm not sure quite how this would work, but a small update about the new Star Wars Land posted to MiceAge mentions that the Stormtrooper Battle Escape dark ride may attempt something never done before on a Disney dark ride. They may ask guests to disembark the ride vehicle to explore a room or two before being rushed to jumped back on and escape from the bad guys once again. It sounds cool... until you really start to think just how this concept could be pulled off with guests who are of different ages, attention spans, and physical ability (or those with disabilities... both physical or mental) and I just don't see how this could ever work. This isn't the first time Imagineers have come up with such an idea however... as I seem to recall hearing about a proposal LONG AGO that would have seen a revamp of the old submarine voyage ride that may have been attached to a new Atlantis or Journey to the Center of the Earth overlay theme. The idea was to put guests on the subs, as normal, and go for a ride through the lagoon and into the caves... but when the subs came back they would be empty because the guests would actually dock and disembark somewhere inside a new ride structure that would be built up and over the old Autopia area that would resemble a volcano. Guests would get out of the subs in what would look like an undersea cavern inside the ruins of a lost civilization and board a ground-based dark ride vehicle for another wild adventure ride similar to the Journey To the Center of the Earth dark ride at Tokyo DisneySea. In that case the two-segment ride idea would have worked, as guests would not be rushed from one vehicle to the other, but rather moved into a short queue to begin the next ride experience for their journey back to 'the surface'. But as for a rushed return to the Star Wars ride to escape an attacking legion of Stormtroopers? I just don't see it. (8/26/16) A great collection of photos showing off the huge Star Wars Land construction progress were sent in by one of our new contributors this week. So much work is going on in this area now, and we are still years away from being ready to open, so it should be very exciting to see how this area develops and changes as the months go by. (7/26/16) Westcoaster is back this week to gaze upon the vast sandy landscape that will soon become Star Wars Land. They also take a peek at the new Frozen musical show in DCA as well. (7/20/16) A great construction update from Disneyland showing off the progress of things over in the Star Wars Land area has been posted to Westcoaster. They've also posted an informative graphic showing off just how the Rivers of America's pathway is being changed and shorted to make way for it all. Meanwhile a few things are starting to go vertical in the new land, and from here I think the progress is going to start to move very quickly, forever changing the look of this side of the park. (7/12/16) Disney released a new piece of artwork showing off a refined and slightly different look at the future Star Wars themed land coming to Disneyland and Disney's Hollywood Studios. Unlike the previous piece of art that was more generic looking, this new piece is obviously showing off the Disneyland version of the land, as you can see the waterway, railroad track and even a keelboat in the water. We can also see what will likely be the entrance to the Millennium Falcon themed ride in the top center, the addition of an Imperial Shuttle on the right side, and Corellian Corvette on the left side in the shadows. Meanwhile a new construction update on the land itself was posted by DisneyGeek with pictures taken just on Friday showing off the latest taking place on site with pipes going into the ground and the first walls going up. (6/28/16) WestCoaster has posted a new photo update from Disneyland showing off the construction progress of the new Star Wars land site as well as a look at the latest changes within the parks. (6/11/16) SlashFilm reports that Disney may be building and testing designs for actual interactive droids that will wander throughout the new Star Wars themed lands in California and Florida in the future. It isn’t known if they will be entirely human controlled or if they would be just semi-automatic droids they could let loose in the lands (with a handler nearby of course) and return to a base when they need a charge. (Kind of like a Roomba maybe? LOL) Either way, adding the droids to the lands would add another layer of realistic theming to bring the Star Wars environment to life, as droids are an important part of the Star Wars Universe, and I’m sure guests would love to take pictures with them as well. In addition to the Droids, add in ways for guests to try to learn to use The Force and interact with other aspects of the new land, and it sounds like there could be a lot of fun to be had in addition to the new attractions. (5/19/16) Will select guests be chosen to be taught to "use the Force" in the new Star Wars lands coming to Disney in California and Florida? According to a report at Behind the Thrills they claim to have heard just such rumors that may at first sound like how Universal lets guests buy magic wands and interact with the Wizarding World. However the way they describe it, the objects guests may use the Force to move around may only happen a few times each day, which makes me believe we may see something more akin to The Sword in the Stone performance that takes place in front of the carousel at Disneyland and the Magic Kingdom. (4/17/16) Disney is having a little fun with what they are calling the official groundbreaking of thenew Star Wars themed lands coming to Disneyland in California and Disney's Hollywood Studios park in Florida. On the Disney Parks Blog they have posted a 360-view of the Disneyland construction site which is a swarm of activity... both real and enhanced with visitors from the Star Wars Universe. Check it out. (4/14/16) A quick look at photos of the Star Wars Land construction taking place around the Rivers of America has been posted to DisneyGeek this week, which offers a good look at what's going on in the backstage areas. (2/24/16) I've got some new updates regarding the Star Wars Land attractions this week. For starters, one of our sources confirmed that despite the media reports mentioning it, the E-Ticket "Battle Ride" concept is not a boat ride. Instead, the ride will feature a trackless ride vehicle that will move about and through very detailed sets and props from the Star Wars universe, including countless Stormtrooper animatronic figures, as well as large scale Tie Fighter, X-Wing starfighters and much more. As for the Millennium Falcon attraction, there are two lines of thought on just what the Millennium Falcon ride system may be. Keep in mind this is mainly speculation right now, as facts are few and far between. Based on what is believed, one possible ride system may involve some kind ride cockpit pod that would also employ the use of a motion-base or KUKA power arm for some of the movement. Another concept I’ve heard of was essentially described as being a Disney Omnimover style ride system, loaded with an endless string of cockpit pods, featuring a steady stream of interactive projection screens for the riders to interact with. One final note... while the new rides are cool sounding, there will be one major disappointment that Disneyland will be forced to live with that Walt Disney World wont. I’m told that once the new Star Wars land opens (which is still looking to be 2020 right now), we can pretty much count on seeing the Star Tours attraction in Tomorrowland closed for good soon after. In an earlier rumor I had heard there would be a Phase 2 build-out to Star Wars Land, and that rumored expansion was thought to include a brand new Star Tours attraction building. This would allow Disneyland to “move” Star Tours into the new land, while freeing up the old Star Tours space in Tomorrowland for something new. Well, that last park will hold true, as a year or two after Star Wars Land opens, the old Star Tours ride is rumored to reopen as a copy of the Iron Man Experience ride opening in Hong Kong Disneyland this year. This will tie into a brand new Stark Expo / Marvel makeover for the current Star Wars Launch Pad attraction. But for Star Tours fans, there will be no joy in Disneyland, though Star Tours will continue as an active attraction in Walt Disney World, Disneyland Paris and Tokyo Disneyland. (2/22/16) Eagerly anticipated Disney special that included a segment with Harrison Ford showing off new details of Star Wars Land has aired... and what did we learn? Apparently... not much. A lot of new Star Wars themed concept artwork was shown, though for most of it, it is hard to tell if it was artwork made for the movies showing off possible new scenes and locations, or if it was made for the new theme park land. You can see many examples of the artwork, screen captures and posted to Disney & More already, and there are a few bits that seem clearly for the parks, especially when they contain the image of someone walking around with mouse-ears on. As for details on the new rides... not so much either. We know you'll ride in the Millennium Falcon and can apparently swivel left to ride and shoot at targets (which sounds a lot of Buzz Lightyear, doesn't it?) and there were a few brief images of the new big ride where guests will find themselves in the middle of a battle between the First Order and The Resistance. Check out the artwork and see what you think of it all. (11/16/16) Star Wars Land isn't even built yet, but would you believe the new land at Disneyland could already have a Phase 2 under consideration? According to Screamscape sources the long-term plan for the Star Wars Land to be built to the North of the park's riverbank, would be to add a second phase that would connect Star Wars land to Critter Country, thus completing a loop all the way around the backside of the park. I have to admit, I like this idea... as I remember how crowded Toontown was back when it first opened with only one way in and out, and I can see the Star Wars Land having the same problem. Creating a loop would not only be best for Star Wars traffic flow, but would finally come up with a solution to the problem of how to effectively move guests through the Fantasmic! show area in the evenings who just want to ride Splash Mountain, Pooh or Haunted Mansion and not watch the show. For years guests wanting to get to the rides have to fight through a crowded and confusing bottleneck of people when passing through the Pirates of the Caribbean plaza and New Orleans Square areas because there is no other option. (12/14/15) I've been sent a fascinating new rumor regarding one of the new Star Wars Land attractions in development. So far, the only fact Disney has issued about the attraction concepts for the land is that guests will be placed in the actual cockpit of the Millennium Falcon in one of the main attractions. Today, one of our sources have sent in a little more information about the possible ride experience, though keep in mind that the attraction is still under design and a lot can change between now and when it opens. That said, I'm told that guests will board a vehicle where it appears that they are sitting inside the cockpit of the Falcon. In reality, there will be several such vehicles (unseen) on a track layout, where the ship will take off and move into a large star field projection room at first. 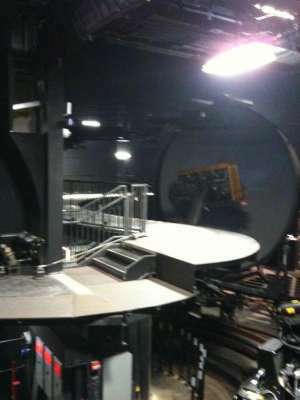 Eventually the cockpit ships will move into place behind an individual projection screen for the simulator/action portion of the ride. The way this will work was described to me as being similar to how Harry Potter and the Forbidden Journey works during specific sections of that ride (see picture), where the individual rider pods are placed inside a projection dome that is mounted to a huge carousel structure. The projection domes and rider pods will move around the carousel in sync during these sections of the ride, where the guests may have some control over the action taking place and what the outcome will be. If you watch the start of this video showing off the addition of a new Star Wars themed area on-board the Disney Dream cruise ship, you will see mockup of the Millennium Falcon cockpit that simulates space travel, that may give you a good visual as to what your ride on the Falcon could be like. ???? - Mickey & Minnie’s Runaway Railway - Rumor - (10/31/18) While Disneyland has not yet confirmed anything, the latest rumor making the rounds this week claims that a clone of the Mickey & Minnie’s Runaway Railway attraction under construction at Disney’s Hollywood Studios park in Florida will be coming to Disneyland’s Toontown as the next big attraction to open inside Disneyland probably about three or four years after Star Wars: Galaxy’s Edge opens in 2019. The attraction's large ride building is said to be built almost entirely backstage so that none of the existing attractions will have to be removed, with the exception of a retail space that is likely to be lost to make room for the attraction's entrance and exit pathways. ???? - Beauty & The Beast Dark Ride - Rumor - (2/10/19) For years we’ve been so focused on what is happening in Star Wars: Galaxy’s Edge and how the Marvel universe will be brought to life across the promenade at Disney California Adventure there really hasn’t been much speculation about what could be the next major project for Disneyland itself. So far we’ve also heard about a rumored clone of Mickey & Minnie’s Runaway Railway that could come to Toontown, but now I’m hearing about another plan for a new attraction in Fantasyland instead. Unfortunately, unlike the Toontown project, adding anything to the cramped Fantastland landscape will come at the expense of removing older attractions. According to rumor the project in mind would bring a copy of the new Beauty & The Beast dark ride under construction in Tokyo Disneyland to California. This is the amazing looking dark ride Tokyo and WDI have been promoting online that features some of the best animatronic figures I’ve seen to date, along with trackless dark-ride vehicles shaped like giant tea-cups. If you haven’t seen the preview video of it yet, check it out below! Ok… back? So far this all sounds fantastic,, but remember what I said about there being a cost to pay. Space in Fantasyland is very limited and to put in a new dark ride of this scale will mean the removal of existing attractions… and often the choice comes down to removing the ones with the smallest lines. In this case, I’m hearing that Pinocchio’s Daring Journey and Snow White’s Scary Adventure may both be on the chopping block to make room. The two inhabit the same large structure on the west side of Fantasyland, and the alternative would be to remove the three classic dark rides on the east side instead: Peter Pan’s Flight, Mr Toad’s Wild Ride and Alice in Wonderland. Unfortunately Pinocchio and Snow White probably have shorter lines mainly because they are much higher capacity attractions, as Peter Pan and Mr. Toad vehicles only fit two riders. For now this is all a rumor, but take the time to enjoy all the classic dark rides when you can. You never know when they might vanish someday.